The University of Reading, in partnership with its accommodation provider University Partnerships Programme (UPP), is drawing up plans to redevelop St Patrick's Hall. With a multi-million pound investment, the proposals will respond to growing demand from students for high quality, affordable accommodation located on or near Whiteknights campus. By better utilising the existing grounds, the number of rooms is expected to increase from 300 to around 1,000. Students will benefit from a range of different accommodation types to suit all budgets. The existing St Patrick's Hall, located on Northcourt Avenue, is coming to the end of its operational design life and no longer reflects the needs and expectations of students attending a world-class institution. 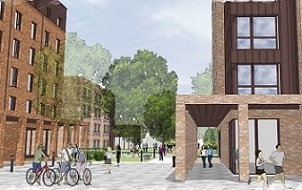 Subject to planning permission, the redevelopment will enhance the hall's architectural quality and environmental performance and transform the facilities for future students, including the building of a catering hub and facilities such as a Junior Common Room and group study area at the centre of the St Patrick's site. Students, staff and members of the local community were invited to view and comment on the plans at a public exhibition held on Thursday 22 October at St Patrick's Hall common room. The project team were on hand to answer questions and explain the plans. Comments can be submitted until 29 October. Vice-Chancellor, Sir David Bell, said: "This is the exciting next stage in the modernisation and refurbishment of our halls. Future students of St Patrick's will have top-class facilities, all up to the best environmental standards. "The proposed redevelopment will enable us to meet rising demand for places and university-owned accommodation next to the main campus, whilst the range of accommodation types will mean that all budgets are catered for. We will be working closely with the local community, staff and students over the coming weeks to ensure we get our plans absolutely right." Sean O'Shea, Chief Executive of UPP, said: "We're delighted to be investing in our largest partner, the University of Reading and its award-winning campus. The proposals have been designed with sustainability in mind and we look forward to receiving comments and incorporating them into our plans." This project follows five years of significant investment in the University's student accommodation - with £275 million being spent across its 5,000 rooms. Proposals are due to be submitted to Reading Borough Council before Christmas, with construction aiming to begin in autumn 2016. The redevelopment will be staggered so that students can remain in hall. The redevelopment will be complete by the start of the 2019/20 academic year. Plans for the proposed redevelopment can be viewed here. Comments can be submitted through this page as well. In 2011, the University of Reading established a 125 year partnership for the operation and management of its student accommodation with UPP, the UK's leading provider of campus infrastructure and residential management services. The deal provided £230 million investment for the University, with UPP taking on responsibility for funding the University halls of residence development programme and freeing up the University's capacity to invest in research and teaching facilities. Since then, UPP has invested an additional £46 million into the redevelopment of Bridges Hall, which opened to students in September 2014. University Partnerships Programme (UPP) is the trading name of UPP Group Holdings Ltd and its subsidiaries. It specialises in funding, developing and operating student accommodation and campus infrastructure schemes as well as delivering residential management services. To date it has invested £2billion in the Higher Education sector and plans to invest a further £1 billion into UK universities over the next four years.